Please let Ecuador’s leaders know that you support their courageous stand in protecting press freedom, as well as their right to grant political asylum and resist United States/United Kingdom intimidation. 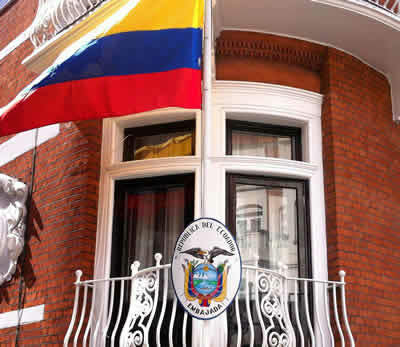 In 2012, the government of Ecuador bravely stood up for freedom of the press and against threats from the United States and United Kingdom by granting political asylum to WikiLeaks editor Julian Assange. In response to his publishing activities that revealed U.S. war crimes and imperial misconduct, Assange was threatened with prosecution in the United State for espionage, while some U.S. political leaders called for his assassination. With an even more aggressively militaristic regime in power in Washington D.C. today, we encourage you to stand firm and not renege on Mr. Assange’s political asylum status. 12438 1 month ago Michael Siebert Marden, ot , AU Please protect Julian. 12434 3 months ago Anonymous Victoria, BC , CA National security is important but so is integrity.